Packers veteran pass rusher Kabeer Gbaja-Biamila missed this past Packers minicamp due to offseasn knee surgery, but reports says that he’ll be ready to go come training camp. “I have no doubt that I should be ready for training camp,” Gbaja-Biamila said. “If this was the season, I’d probably be out there trying to get back on the field. I’d be on the field actually doing some stuff. But we’re not in any rush. We’ve got time on our side.” Gbaja-Biamila is a big reason for the Packers success on defense, as last season in 15 games he had 9.5 sacks to go along with 26 tackles. 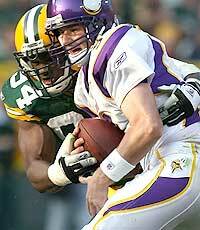 Having him on the field leading the way on defense will for sure be a help for a new look Packers defense in 2008.